Being able to take accurate measurements is essential, especially for people who work in the technical fields. One of the tools that most people rely on is the digital caliper. The device is mainly utilized by mechanical engineers, carpenters, as well as those in machining. Additionally, digital calipers are used in metalwork. The fact that digital calipers can be used for a wide range of applications makes them reliable tools, and that is why you might find numerous brands in the market. With the many brands in the market, you have to be careful when picking a digital caliper because each product is unique and designed to deliver differently from the others. You may be swayed by a cheap model that looks the same as an expensive alternative, only to be disappointed by the quick drop off in accuracy. 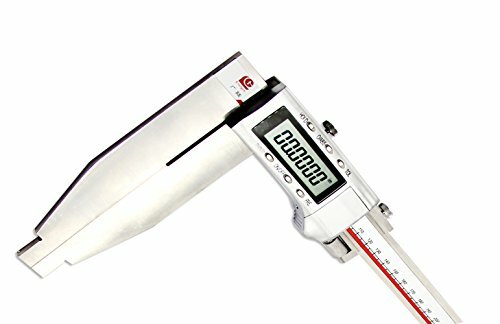 You also need to know that there are digital calipers that utilize standard/ metric units, and there are those that let you input the readings into a computer. The popularity of digital calipers hails from the fact that they are easy to use, and they provide users with fast and highly accurate results. If you are looking to find yourself a digital caliper but don’t know where to start, this article will conduct a comprehensive review of the best digital calipers that you could find in the market. Technically, a caliper is a measurement equipment that is utilized to measure the dimensions of items that are hard to measure using a ruler. Besides digital calipers, there are other types of calipers such as a Vernier caliper, a dial caliper, an outside caliper, and an inside caliper. Of all these types, the digital caliper is the most recent tool. A digital caliper will display measurements on an LCD and provides you with the most accurate results. Have you been looking for a digital caliper lately? If you have, you could consider reviewing some of the renowned brands in the market that you could get yourself. The most common brands include iGaging and Mitutoyo. Before you venture into the market to get yourself a digital caliper for your technical works, there are some considerations that you have to make. Here are the most crucial ones. When purchasing a digital caliper, you have to consider the build quality because they are made of different material. You can find a digital caliper made of plastic, composite, carbon fiber, or stainless steel. Regardless of your profession, it is advisable that you settle for a digital caliper made of stainless steel for enhanced durability. You, however, should expect to pay a little more for the durable product. Since a digital caliper requires you to read data from an LCD, you have to make sure to select a tool that has a great display size to enhance readability. Digital calipers have varying lengths, and it is advisable that you choose a tool that works best for you. The recommended size is between 4 and 12 inches. However, professionals can settle for a digital caliper whose length ranges between 24 and 48 inches. Before you purchase a digital caliper, it is imperative that you set budget limits because different items are priced differently based on the manufacturer and their build quality. As such, you should conduct adequate market research to ensure that you get a digital caliper whose value matches its quality. Most importantly, the caliper you buy should be within your spending limits. Cheaper models will tend to require calibration more frequently and be less accurate, particularly over time, than their more expensive counterparts. The best precision tools cost a lot of money, and I mean a lot. But that is the price of incredibly precise measurement, at the microscopic level. The engineering, materials and skill that go into producing that level of accuracy is not cheap. Additionally, you have to check the IP54 protection of the digital caliper you intend to buy. This is because the feature protects your tool from damages by water and dust. The 500-196-30 is an affordable digital caliper that measures 0 to 6 inches (0- 150 mm) in 0.0005-inch (0.01 mm) resolution for accurate use. It is made of sturdy stainless steel for enhanced durability. This Mitutoyo digital capiler also includes a digital LCD that shows measurements in inches and metric units to enhance readability. It is also quite versatile because it allows you to measure the outside, inside, step, and depth values. Moreover, it includes a protective case for safer storage, and it comes fitted with a silver oxide battery. You might buy a counterfeit product if you don’t purchase yours from a reliable retailer. If you are looking for a digital caliper that has IP54 protection, then you might consider settling for this tool. Besides its affordable pricing, the iGaging ABSOLUTE comes with a two-year warranty, making its longevity a non-issue. It is made of stainless steel and has a resolution of 0.0005 inches or 0.01 mm and an accuracy of 0.0001 inches or 0.02 mm. 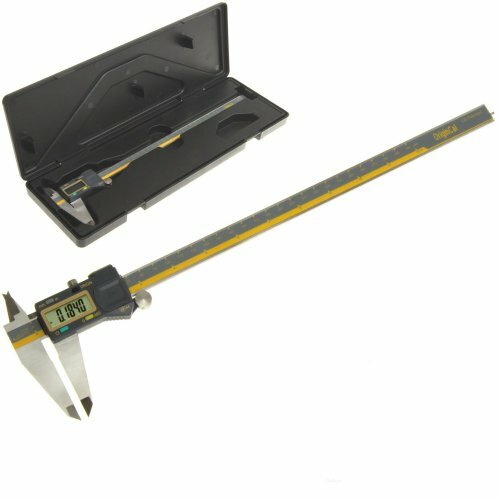 This digital caliper is designed to have a range of 12 inches or 300 mm. It is designed to be dust and water-resistant, and it comes with a USB cable. There are a lot of digital calipers on the market, and the Starrett 798A-6 might be one of the best that you could find in the market. It is made of sturdy stainless steel, and it comes fitted with a well-sized digital display to allow you to read measurements much easier. It is built to measure 0 to 6 inches (0 – 150 mm) resolution with an accuracy of 0.0005 inches (0.01 mm). Interestingly, it has IP67 ratings, making it resistant to dust, oil, and water. Additionally, it is coolant proof. It also meets international DIN 862 standards, implying that it can provide you with accurate results. It is a bit pricey but this level of quality in a precision tool comes at a price. 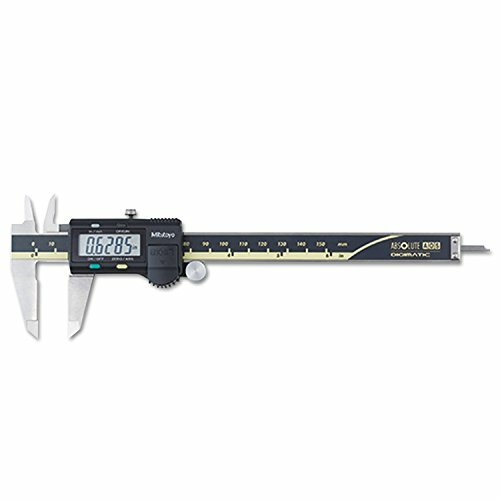 Mitutoyo is at it again with the 500-506-10 digital caliper. If you choose to go with this item, however, you better be prepared to dig deeper into your pockets because it is costlier than the others mentioned above. With a 0 to 24-inch (0 to 600 mm) range, this digital caliper has a 0.0005-inch (0.01 mm) resolution with a + or – 0.002-inch accuracy. It is a versatile tool that is capable of handling harsh workshop conditions, and its 780 mm length makes it ideal for measuring large items. Moreover, it is made of stainless steel to enhance its durability. For convenience, its LC display shows measurements in inches and metric units. This digital caliper is one of the favorites among individuals who work in technical workshops. It is a fairly-priced tool that is IP67 certified to enhance its resistance against water, dust, coolant, and dirt. Its range is from 0 to 8 inches with 0.0005-inch and 0.01 mm accuracy. Additionally, it has a large LCD with highly defined characters, which makes it easy to read. The 798A-8 also includes NIST-traceable calibration certificate with data. If you are looking for a digital caliper that falls in the middle price range, then you could consider purchasing the BAOSHISHAN 0-300mm/11.8 Inch Digital Caliper. It is made of sturdy stainless steel frame to enhance its durability, and it comes with an ABS function. It also includes an LCD, and you could set it to zero at any position. Interestingly, it has a HOLD feature that allows you to lock the number that is currently displayed. The tool has an accuracy of 0.01 mm and is most suitable for metalworking. Carrying out measurements in your workshop requires using a tool that can give you the most accurate results. This digital caliper by Precision Tools is capable of achieving that. It has a resolution of 0.0005 inches (0.01 mm), and it provides you with an outstanding accuracy and precision. It has an accuracy of 0.0015 inches (0.03 mm). Furthermore, you can view the measurements on the LCD in inches and millimeters. Besides its high-quality construction, this digital caliper also includes a thumb roller to enhance its sliding. Interestingly, it also comes with a spare battery and a screwdriver. Starrett is at it again with this impressive digital caliper that has a range of 0 to 24 inches (0 to 600 mm) with a resolution of 0.0005 inches (0.01 mm). The tool has no IP ratings, but if you opt to go for it, you should be ready to spend a lot. It includes an SPC output and has an accuracy of + or – 0.002 inches (0.05 mm). It is also made of carbon fiber to help reduce its weight. Starrett are known as a global leader in precision engineering and precision tools. Tools of this particular quality and standard are very expensive when compared to bog standard or cheap models. But with the price you get unmatched calibration and accuracy at the microscopic level. Quality that lasts a lifetime. If you are one for style and precision in your workshop, you might consider getting the Brown & Sharpe Digital Caliper. This is a stylish tool that has a 7 mm LCD that has a 0.0005-inch resolution with an accuracy of + or – 0.001 inches. Additionally, it meets IP67/ DIN862 standards, and it features a magnetic measuring system for utmost precision. 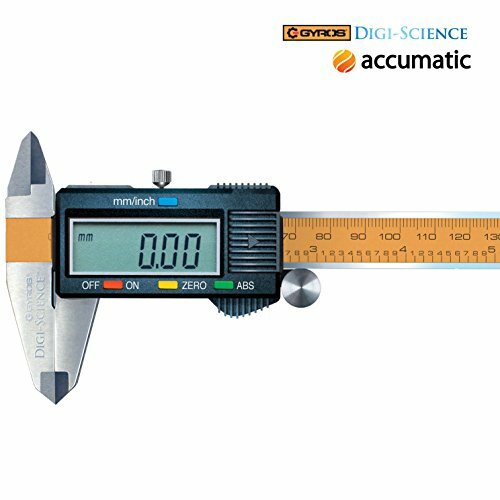 Last but not least, we have the DIGI-SCIENCE Digital Electronic Caliper. It is designed with a range of 0 to 6 inches (0 to 150 mm), and an accuracy of 0.001 inches (0.03 mm). It is made of stainless steel, and it includes a thumb roller for easier sliding and taking accurate measurements. One of its most impressive features is its large, high-resolution LCD that allows easier readability. It is also a versatile tool that is economically priced. 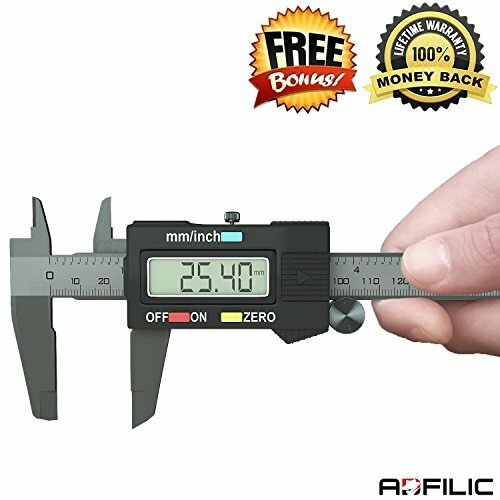 This article has given you ten quality digital calipers that you could get in the market. Ensure to check out the features of each so that you can easily select the one that suits your needs. Additionally, be sure to keep the considerations mentioned above in mind before settling on a product. This is because they could help you make a smart purchasing decision.